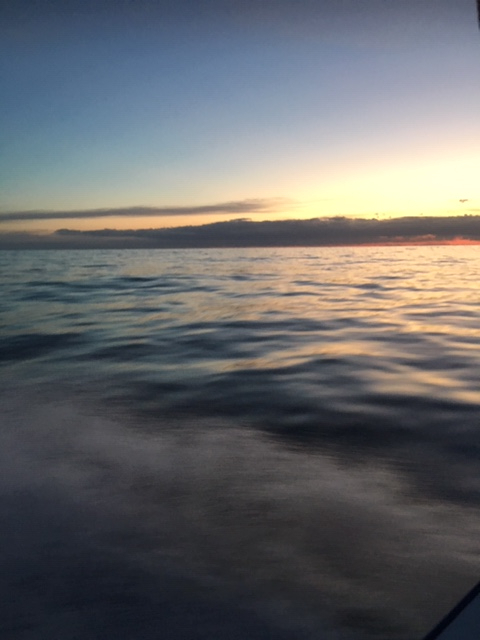 Left inlet at 0500 to beautiful seas, just a slow gentle swell. 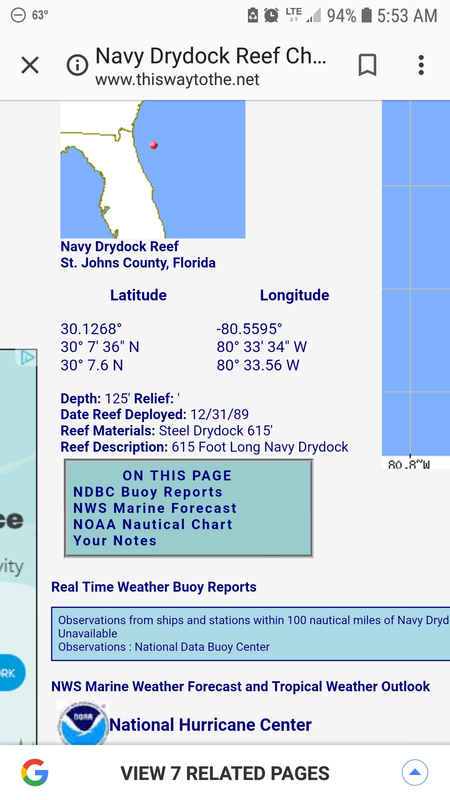 Arrived east of the drydock around sunrise, the water temp was already 74. Put out a trolling spread and headed east towards the ledge. No flying fish, rips, hardly any weeds, or other signs of life. Trolled the 8 miles to the ledge without a sniff. Reports on the radio were equally depressing out to 1000 feet. Put away the trolling gear and started bottom fishing. Started at the ledge and picked up a nice trigger on the first drop, then nothing but short b-liners. Hit another 4 ledges and broken bottom working my way in shore. None of my spots producing any keeper fish, all small fish and grunts. Had a teenager onboard, and he was getting bored with the bottom fishing. Decided to run over to the dry dock to have him pull on some AJ's or big sharks. We caught a huge b-liner on the first drop and 2 small kings on the speed jig. When the second king came to the boat it was followed by 6 big dusky sharks that were all excited swimming around the boat. About 20 barracuda took up residence under the boat. Teenager wanted to catch a shark so we got him hooked up to one of the duskys with a grunt. Hooked a few more fish on the speed jigs to have them immeadiately eaten by sharks. Teenager was recovered from his shark catching and wanted to catch a cuda. Freelined a pinfish and it was eaten by a huge cuda about 4 feet long. It was so big it could barely get out of the water when it jumped. Saw two big swirls out by the cuda where a big shark devoured it in two bites. We broke off the shark and decided to move to the up current side of the wreck to get away from the sharks. 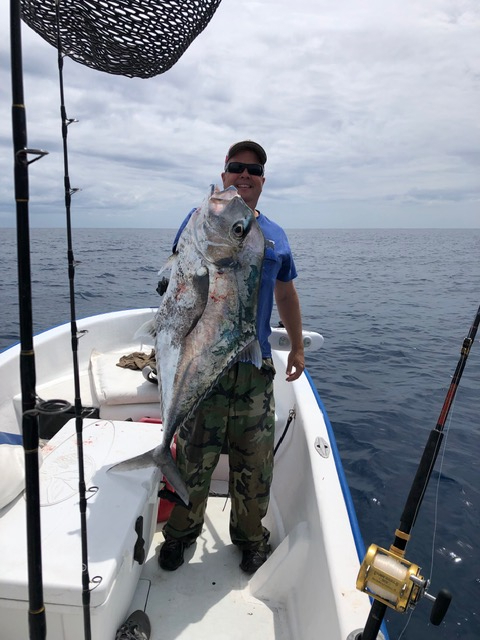 Since we caught a few small kings on the jigs, we decided first to troll some plugs around the wreck to maybe pick up a big king or wahoo lurking around the wreck. Made 6 passes around the wreck with no hits. Stopped to reel in the plug and the plug was hit. 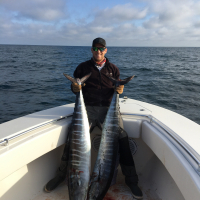 Big long run on the 50 wide made me think maybe a wahoo or nice king. Saw a big flash of silver when we saw color and was suprised to see big african pompano. That's an awesome fish! Hopefully the mahi start showing soon. making lemonade out of lemons !! 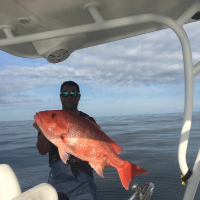 Really nice fish and great report. Wish I could have gotten out but work is killing me right now. At least someone is getting it done. What kind of jig do you prefer? I’ve got a lot of learning to do. Thanks I believed the reports and stayed home. Awesome do you run wire off the plug? Stud pomp. You play with your sounder any? I used a wire cable trolling harness. Archie from strike zone made them up for me. Had a failure last time out on straight wire to the plug. After hours of trolling, the action of the lure broke the single strand wire and I lost a plug. I tried 83 khz on my simrad and it did show more of a return under the bottom vs the 200 khz. But still seems to be lacking once out past 100 feet. Could not get a reading at all on the 50khz setting. Would not read the bottom at all. I use williamson jigs at the moment because a guy was selling them at the st augustine marine flea market for $3 a jig. He had about 30 jigs, told him I would by all for $2 a jig and he said yes. Try not to pay more than $3 for jigs since you lose alot. It hurts alot more when you pay $14 for a shimano jig. Interested in trying out the new slow pitch jigs, they look like they catch more of an assortment of fish than the speed jigs. That's a sweet AP! That ocean does look nice, too. Pangaman, I've got a slow pitch set up that I'm dying to use offshore. I live near Mayport and can share my slow pitch rod with you and give you some money for gas. Please message me if you would like to do this. I have caught 4 of them off the dry dock. I guess they like the high structure. Caught one on a jig, one on a plug, 2 on small live bait. My neighbors brother lives in Georgia and he says they catch them at the Navy towers on fiddlers. That would be right up sea snakes alley. Slow pitch jigging is where it's at. You will crush any species that dwells at the dry dock or any of your wrecks. Man, If I hooked one of them on my sheepshead rod with fiddlers....I'd faint thinking I had a world record sheepy !! It'd be a cool ending though for sure !! Where are the drydocks? Hadn't heard of that one.